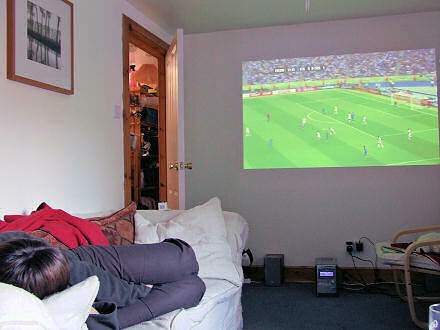 Yesterday evening, in preparation for watching the World Cup finals Final (France v Italy in Berlin) I connected our Philips TV digibox to Jane’s LCD projector (InFocus X2) and to the stereo giving us a massive 73″ screen. One of the problems with our living room here is that it is so narrow. It’s less a living room and more a dentist’s waiting area, but with less anxiety. If I’m sitting on the floor watching the telly my legs extend beyond the back of the TV set! And you can really only see the screen properly if you are sitting on the sofa, directly in front of it. So it was a welcome (and quite exciting) relief to convert the living room into a small cinema for the evening. Although … we’re now quite reluctant to take it down. It’s giant Big Brother from now on, methinks. How come Jane owns a projector?? Wow! Giant Big Brother….so why, oh why has Nikki been evicted tonight? I had her down as a joint favourite with Pete. It just wont be the same anymore, will it? Hector would love to know! The projector belongs to the business that Jane and her Mum run, called Enneagram Scotland. Previous Previous post: How do you pronounce ‘Yngwie’?